Schuyler Colfax, former Speaker of the US House of Representatives and Vice President. Library of Congress. This week’s notable Hoosier obit focuses on one of Indiana political history’s most important, and slightly controversial, public figures. Schuyler Colfax, former speaker of the U.S. House of Representatives and vice president under Ulysses S. Grant’s first term, was a major player within the Republican Party during the late nineteenth century. However, his political career ended in controversy when news broke that he was a minor player in the Credit Mobilier scandal that also threatened Grant’s tenure in the White House. 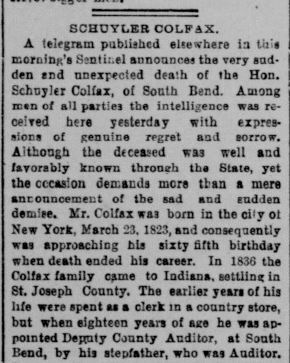 News of Colfax’s death on January 13, 1885 was somewhat inconspicuous. 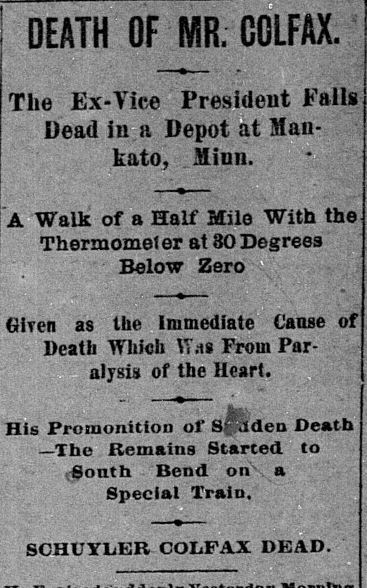 Indianapolis Sentinel, January 14, 1885. Hoosier State Chronicles. 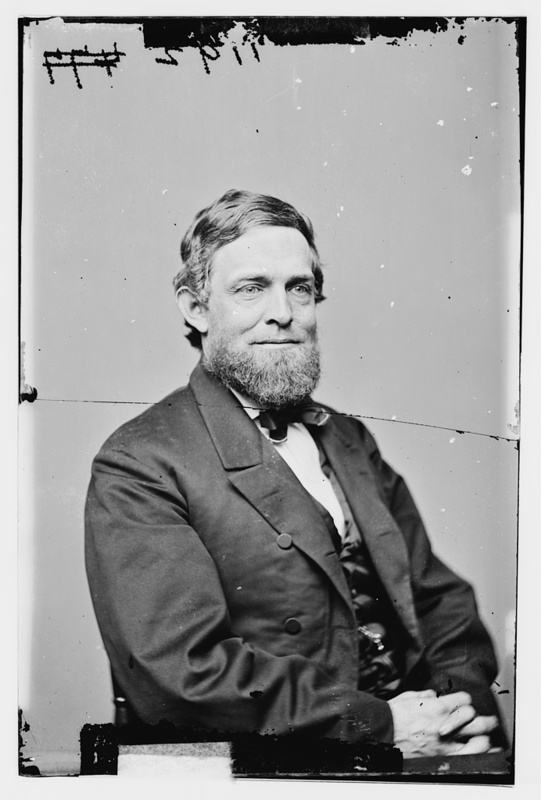 Schuyler Colfax was born on March 23, 1823 in New York City. He and his family moved westward in 1836, settling in St. Joseph County, Indiana. As the Indianapolis Sentinel reported in his obituary, the “earlier years of his life were spent as a clerk in a county store, but when eighteen years of age he was appointed Deputy County Auditor, at South Bend, by his stepfather, who was Auditor.” This was the start of his life-long involvement in politics. 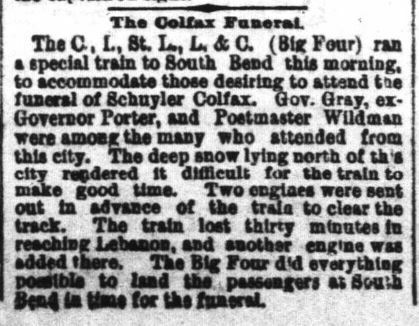 Daily Wabash Express, January 14, 1885. Hoosier State Chronicles. Colfax also gained political experience when he served as an “apprentice in the [pro-Republican] Indiana State Journal office, when that paper was under the management of John D. Defrees.” Later, in 1845, he established his own newspaper, the St. Joseph Valley Register in South Bend. As the Indianapolis Sentinel reported, Colfax “was both editor and proprietor of this paper, and made for himself quite a reputation as a vigorous political writer.” He also “prepare[d] himself for the bar” during this period. Masthead of the St. Joseph Valley Register, circa 1863-1865. South Bend Tribune Online. In 1850-51, Colfax served as one of the delegates to the Indiana Constitutional Convention, where he staunchly “opposed by voice and vote the clause prohibiting free colored persons from coming into the State.” Defeated as a Whig party candidate for the U.S. House of Representatives in 1851, he eventually won election to the House as a member of the newly-formed Republican party in 1854. He served in this body for the next 14 years. After the election of 1860, President-elect Abraham Lincoln gave Colfax some consideration for a cabinet post, before he settled on Indianan Caleb B. Smith. In 1863, during the height of the Civil War, House members elected Colfax as Speaker of the House. During his time leading the House, he helped secure congressional passage of the 13th Amendment to the U.S. Constitution, ending slavery, on January 31, 1865. The states ratified the amendment on December 18, 1865. 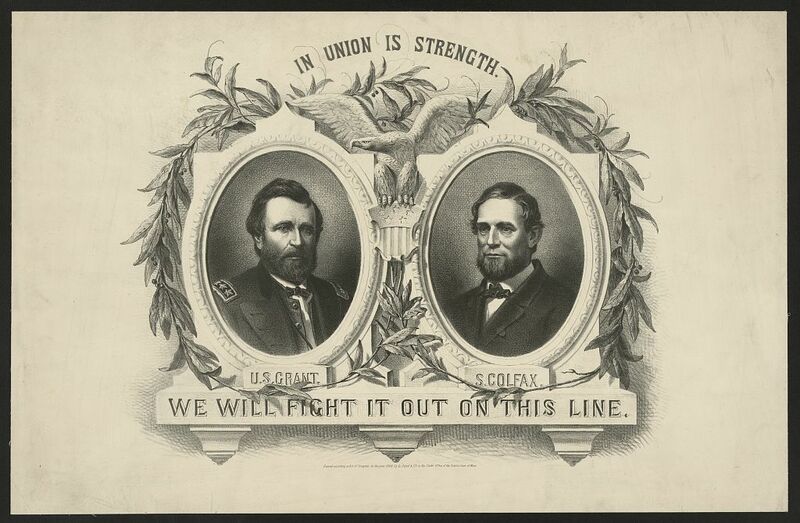 1868 presidential campaign print. Library of Congress. In 1868, while still serving as Speaker, the Republican Party nominated him to be General Ulysses S. Grant’s running mate. They won the election on November 3, 1868. Colfax would serve only one term in Grant’s administration. In 1872, Colfax announced that he was retiring from politics. The Republican Party nominated Henry Wilson to replace Colfax on the 1872 reelection ticket. However, there was a practical reason for Colfax’s retirement and the party replacing him as vice president nominee. New York Sun, September 4, 1872. Chronicling America. 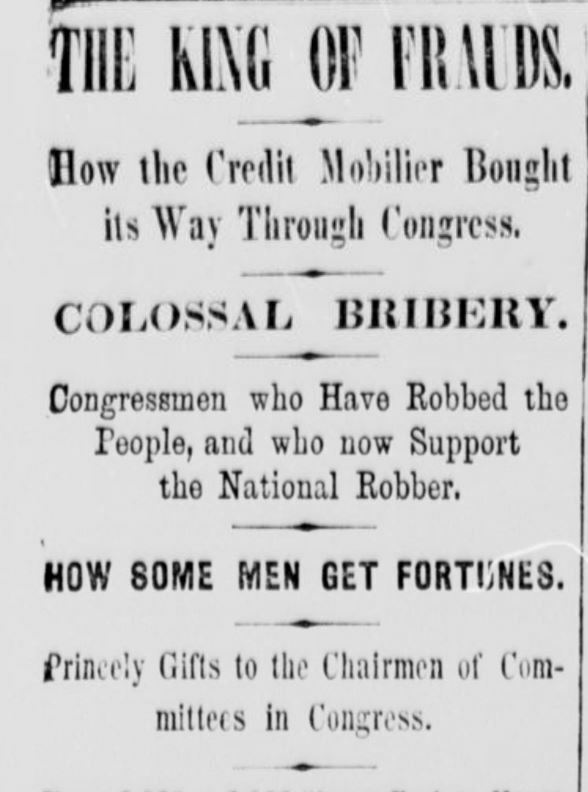 During 1868, Colfax became involved in a railroad shell corporation called Credit Mobilier of America, investing his own money into the scheme and receiving a $1,200 dividend check from Oakes Ames, a Congressman who roped some of his colleagues into it. After the New York Sun broke the story, Colfax was later implicated in the scheme and nearly impeached. The impeachment proceedings stalled because Wilson replaced Colfax on the ticket. (Consequently, Wilson also became implicated in the scandal, but died of a stroke in 1875.) After nearly 20 years of success in public life, Colfax left Washington in 1873 a defeated, slightly tarnished man. Greencastle Times, January 15, 1885. Hoosier State Chronicles. 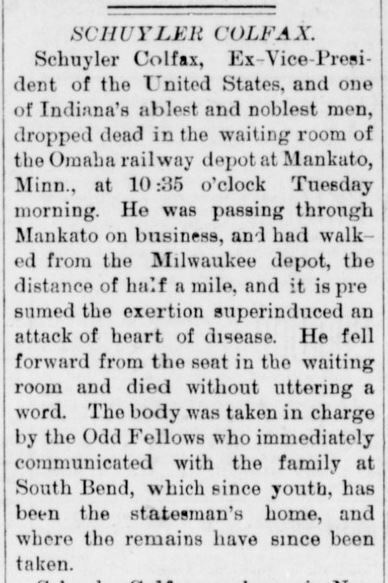 Indianapolis Sentinel, January 17, 1885. Hoosier State Chronicles. On the other end of responses, the Terre Haute Express did not even mention the affair. Finally, on the day of his death, the Indianapolis News published a column that fully defended Colfax against accusations of impropriety. “The case against him, wrote the News, “as having received $1,200 in an ‘S. C. [presumably for Schuyler Colfax] or bearer’ check from Oakes Ames was a strong one circumstantially but lacked direct conclusive proof, and against it Mr. Colfax put a private life without stain and a long and honorable public career to that time unsullied.” The Odd Fellows, of which Colfax was a member, attended to Colfax’s remains, and escorted the body back to Indiana via train within a few days. He was buried on January 17, 1885 at City Cemetery, South Bend. 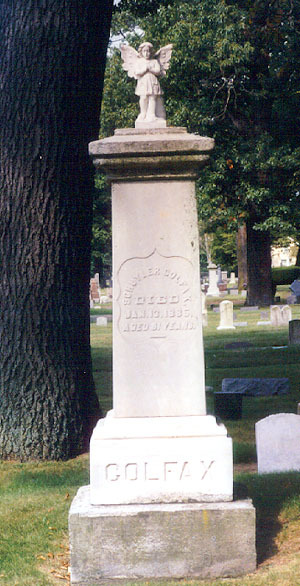 Colfax’s grave at City Cemetery, South Bend, Indiana. Findagrave.com. Despite Colfax’s involvement in one of the nineteenth century’s most explosive political scandals, his career in the House of Representatives, especially his help in passing the thirteenth amendment, deserves some level of recognition. Like many leaders of the Gilded Age, Colfax involved himself in an unsavory business arrangement that ruined his chances for higher political office. Nevertheless, he tried to rehabilitate his reputation and enjoyed a few years of success on the lecture circuit. While most Americans may not think of Schuyler Colfax when discussing the Civil War and Reconstruction eras, he was one of Indiana’s statesmen that left an indelible, and slightly infamous, mark on political life during the times. 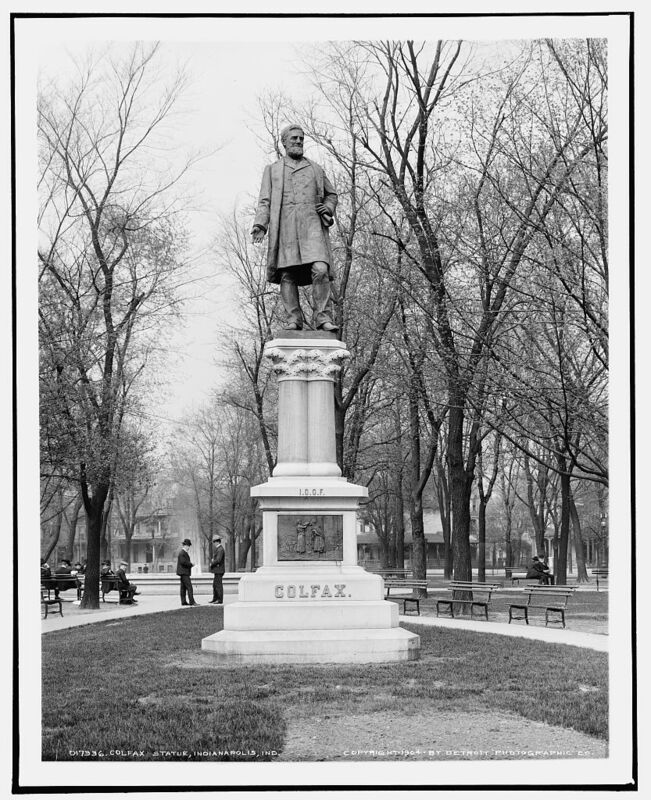 Schuyler Colfax statue in Indianapolis, 1904. Library of Congress.